Maia Rimora was born into a litter of six, the fourth to be born in fact, in the city-tree known as Ahvast Nul, a rather minute city in comparison to the Capital but one that held many Cather and several clans to its name. The Rimora clan in fact, was the largest known to the city; it had gained a large group of follower given its policies to defend the Cather people, regardless of how violent and cruel the methods could be. Despite being a member of this clan in particular, she and her litter mates did not live any different from the rest, it was an average – middle-class childhood, currency did not hold much in the way of finding a good life on, honour was all that mattered and the protection of the city tree. As such, Maia spent the majority of her childhood interacting with the other children, befriending them as clan mates, as they all knew that they would one day be the future of Ahvast Nul, while studying Mathematics, Basic and her native tongue of Catharese. It was around the age of seven that Maia and her eldest brother began to show signs of being force sensitive, while her oldest brother; Chút began to experience the ability to move items in the physical world, if only slightly, Maia felt the force differently, it was her senses that heightened, to the point of being able to feel and sense the emotions of others rather than the individual themselves, it was minute and only affected her when in contact with people she was incredibly close to, her clan and her family. Unaware of the ability or the force, it was a trying time for the girl, the passion that many of her kind felt; including her own was more than just overwhelming, struggling to juggle her own emotions, let alone those of another person. It was only six months following this ‘awakening’, that a Jedi came searching for prospect students to join the Order, he was quick to find Chút suitable for consideration, it took him a little longer to figure out how and what she was displaying, it was through observation, how her mood could change to those around her. The Jedi in question was an investigator and a watchman, Jedi Master Ralaron Mulloc, he witnessed how the girl changed from day to day, unlike her brother Chút, whom he noticed from the moment he met the boy, he grew ever so curious about the girl. Taking note that this form of empathy was not attached to the natural abilities of the Cather, he questioned, she answered, honestly yet filled with confusion. It was from there that he felt it necessary to take the girl to Coruscant. The Clan Elder and Parents hesitated and almost disagreed entirely on the matter, a girl and a boy being too much, he soon explained to them how dire the situation could get. Chút and Maia soon left their home world for Coruscant, her parents begrudgingly saying goodbye to her, which only fed her desire to stay. Regardless, she arrived at Coruscant and after a few months of testing the proverbial waters, both herself and her brother were initiated into the Jedi Order, the Council warned the two however, to not fall prey to their nature, their passionate nature and the longing to hunt as adjusting to the Jedi Way was no easy feat for the Cathar. Believing it would be for the best, Chút was transferred to the Enclave of Dantooine. Now alone and in need of company, more now than ever, Maia took it upon herself to do something she would rarely do; venture from outside her clan to befriend strangers, it was an odd and enlightening situation, even going to the extent of befriending an individual only attending the Temple part time, unsure of where he came from and why he was there to begin with, she also said farewell to yet another person she grew increasingly fond of, as the years progressed she grew increasingly fond of those with-in her Padawan clan, studying the basics of Shii-Cho, the Force and the beliefs the Jedi hold true to. At the age of fourteen, it was Master Mulloc, the same Jedi Knight that had sought her out from the start, was the one to mentor her. Master Mulloc clearly stated that his ideal plans for the future were to teach her how to control her empathy, while it was active only on the off chance, it was very much there and at times, he could see she struggled with the ability during heated exercises, despite how reserved she appeared to be on the matter. Sadly, he was often busy with off-world work as an investigator, believing Maia to be unready for the dealings of the galaxy that awaited her beyond the walls of the Enclave. 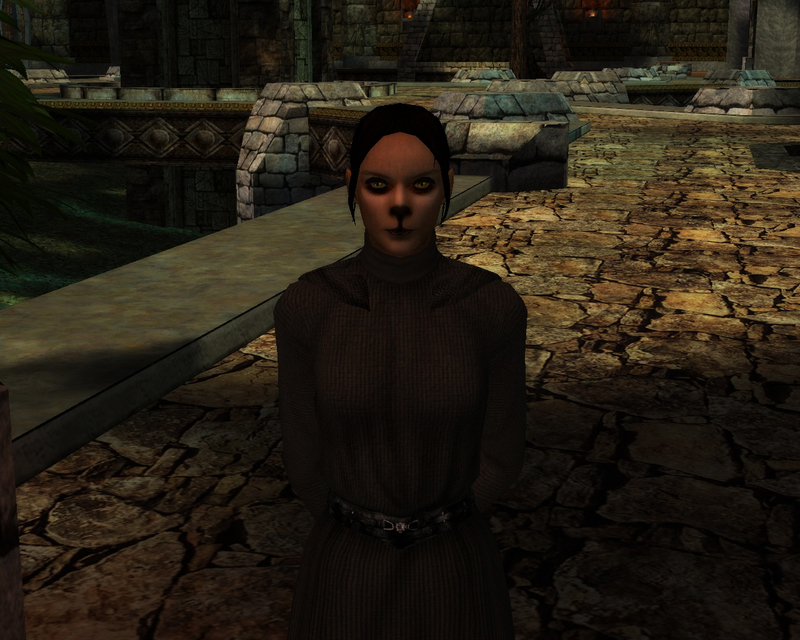 It was on her sixteen birthday that she saw herself fit to travel back to Cathar, to perform the bloodhunt, an old time tradition where Warriors among the Cathar would shed the darkness from themselves and to earn their place as adults. Despite all warnings from her Master to not attend the ritual, she did so anyways, not out of defiance but to prove to herself she was capable. Chút was also present and as such, it was a re-union of sorts. Taken to the outskirts of Maine Nul to perform the ritual, she was briefly trained how to wield the Cathar Honorblade by a renowned warrior known as Styx. He was more than just disapproving of Maia, he loathed her, however she pursued to finish what she came to Cathar to do in the first place. Alone, she was set forth to battle Kiltiks that plagued their world. While thinking strategically, she opted to avoid conflict with any creature unless it was the Queen herself. Upon meeting the Queen, she reached out with the Force and its emotions became clear to her, afraid and scarred, the creature had seen many Cathar and felled them in return, she saw the cruelty and unjust actions. Maia found that the ways of her people, were not her ways nor the ways of the Jedi. Refusing to take part in causing pain towards a creature that only acted as nature intended to, she was banished from Maine Va and her home city of Ahvast Nul, she was to be considered without a clan and unwelcome to either city due to her actions. As heart breaking as it seemed, she drew inwards, she became more reserved than ever, which was only to be reinforced when Master Mulloc fell ill, unable to continue his desire to teach her, she was left without a Master. This was not for long, Master Mulloc reached out to a former Padawan; Master Bo Iiln, wishing for him to take Maia from Coruscant to continue her training. The Jedi Knights’ answer was: Yes. 314.07 ABY – Birth Date. 320.18 ABY – Initiated on Coruscant. 324.22 ABY – Maia Rimora passes her Initiate Trials. 327.05 ABY – Maia Rimora is taken as Master Mulloc’s* Padawan Learner. 331.10 ABY – Master Mulloc falls ill, Maia Rimora is transferred to the Enclave of Alzoc Three and taken as Jedi Knight Bo Iiln’s Padawan Learner. 332.12 ABY – Maia Rimora is taken as Jedi Knight Silas Vir’n’s Padawan Learner. 337.17 ABY – Maia Rimora is taken as Jedi Master Alehk Thol’s Padawan Learner, to train alongside her Padawan Brother, Wrennin Vae. 338.03 ABY – Knighted in the presence of the Yavin Council.